2011 WBPF Asian Men's Bodybuilding Championships was held in the beautiful city of Bangkok, Thailand on October 6 and 7. The contest attracted 30 countries with about 100 athletes in men's bodybuilding events. 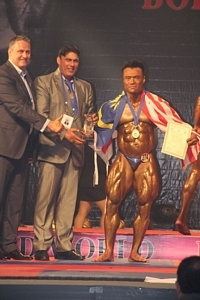 It was my second Mr. Asia title, my first was in 1999 when I got a gold for Malaysia in Lightheavyweight class and this year I grabbed a gold in the super heavyweight division above 100kg. 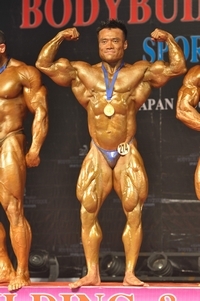 The standard of bodybuilding in Asia has improved a whole lot since I last competed in 1999. I was really surprised how good some of these contestants looked and I am sure WBPF (3 years old) will become one of the top bodybuilding federations in the world in the near future as more countries are joining and hence making this fed more reputable as time goes by. I am thrilled to win Mr.Asia for the second time and hope to win a few more before i retire in 4-5 years. Not bad for a 41 years old veteran to do and win this ceveted contest after a laspe of 12 years! I am happy to be able to make Malaysia proud in Mr Asia and now my focus is entirely on the World Championships (Mr.Universe) in Melaka on 11 and 12th November. This is the main event I am targeting this year and hopefully I can bring glory to Malaysia again. Malaysia BOLEH!